For more information, contact the author Frank Allan. Wow! 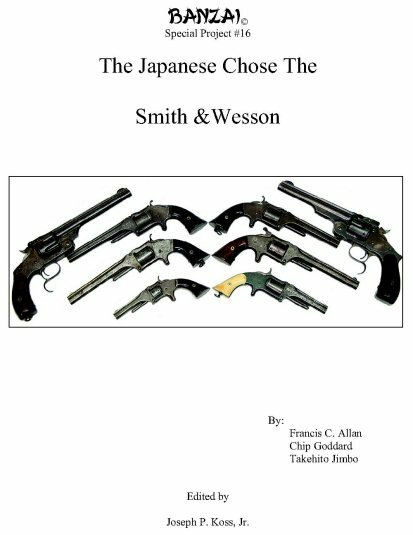 Once again, the Authors of The Japanese Chose The Smith & Wesson have created a must have for the Collector of Japanese weapons...the color pictures & translations of their markings are more than worth the nominal $18 'price of admission.' The cross reference of Kanji markings to English will be invaluable in translating those mystical markings on the weapons we encounter in our collecting endeavors. Known surviving examples, markings, & translations in published form allow for comparison, study, & reference for similarly marked weapons of non-Japanese manufacture. The authors continue to illuminate the previously lightly researched field of 19th Century Japanese Firearm Collecting. Limited Printing, Buy an extra copy, I did! Buy yours NOW! The next greatest thing since sliced bread,	Milwaukee's Best Light Beer, The Type 38 Arisaka and Japanese Imported Arms! We helped take some more pictures!